In the past many of our loyal users have contributed to Project Planning Pro and helped make it a huge success that it is now. With all your support and feedback we have made Project Planning Pro an app that is used by over a million users worldwide. To make it even better our users’ participation really is the key. We are planning to release many new features in the months to come on all the platforms the app is available on. However we would like to hear from our users first hand, as to what you guys feel is need of the hour. This will help us prioritize our development efforts and bring out the features that matter to you first. Therefore we are forming an official volunteers team called ‘Builders’. The team will have very simple responsibilities and specific rewards. We will listen closely to each of our members and analyze your feedback. We hope everyone will consider joining to improve Project Planning Pro and we in turn will tell thousands of our Social fans about who our Builders are. Builders will get assigned levels as soon as they sign up, which means you are a special user of Project Planning Pro who works with us. The highest Level 4 is also called the Ninja level. We will credit our Ninja’s on our social pages for every new app update. We will also give out iTunes gift cards to our Ninja’s from time to time. Come join us and be part of our awesome Project Planning Pro team. Simply fill up the form below to get started. We have received feedback from our users that the app is crashing while creating new plans. We are working very hard to fix this issue and expedite a new build in the App Store. If you are an existing user and have not updated to the latest version already, we would suggest not doing so until further notification from us. We regret the inconvenience caused and will fix this issue at the earliest. Update: This bug is now fixed and update 1.7.5 is available in the App Store. We sincerely apologize for the delay in getting this Update out. We recently found a new bug in the current version of PPP 1.7.4 for iOS 8 only. Task durations are getting calculated incorrectly and at times are becoming zero. We are aware of this issue and are working hard to fix and release a new build today. Kindly bear with us. We will keep you posted as soon as we have the fixed version live. Update: Version 1.7.1 is now available in the App Store. Add Column bug is fixed in this version along with other minor bugs. Update now. We moved the ‘Add Columns’ button under the settings menu in the latest version release 1.7 [As see in the screenshot below]. The new button is not working as intended and is causing the app to crash. We have fixed this bug and submitted a update 1.7.1 to the App Store which is currently under review and should be available soon . 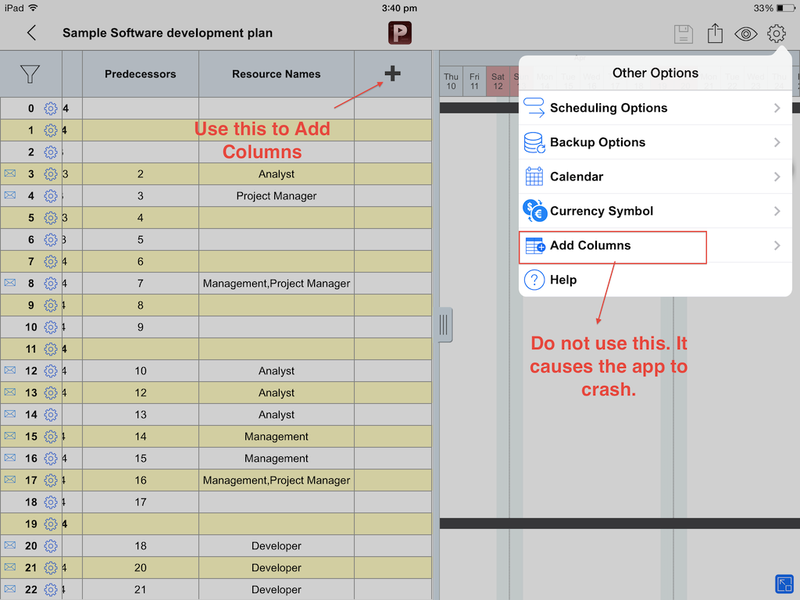 In the meanwhile, you can add new columns from the old button as shown in the screenshot below. We regret any inconvenience.